Do you remember the joy, beauty, and refreshing look of your commercial landscape and lawn when first installed? Are you in love with the layout and plants but over the years have started to overlook it? You may find that the love you first had for your commercial landscape has begun to diminish while over the years it has begun to look rundown and drab. What if there was a way to give the old landscape you loved a push in the right direction? This is where a Fertilization Program comes into the picture. With fertilizing and chemical services, your old commercial landscape and lawn can become refreshed by giving it the nutrients and treatment it needs to become healthy and green again. Services such as broadcast fertilizing are one way to accomplish large application of fertilizer and chemicals by dry or wet application using large spreaders. For trees, deep root fertilizing is accomplished at the “root” of the issue with an aeration like a tool that injects fertilizer approx. 12 to 14 inches into the ground near the tree’s root zone. 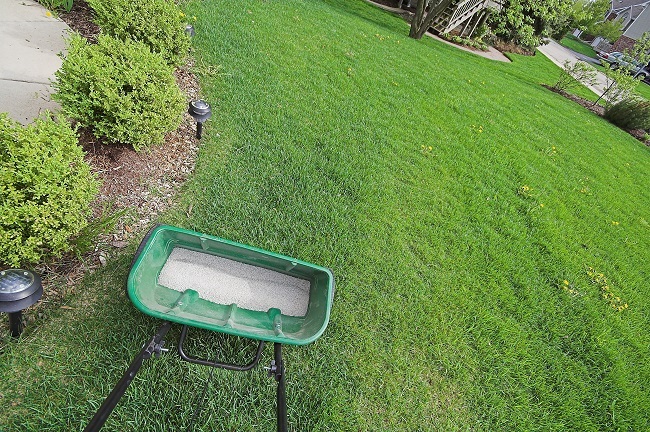 While surface fertilizing can also be done to help your plants and trees, deep root fertilizing assures the “medicine” is getting to the roots of the tree quicker and in turn, giving quicker results. Much like humans, plants can run out of local nutrients in their “bodies” and need a shot to get things moving again. With tree injections, common problems like nutrient deficiencies, insect infestation, and disease can be corrected as well. Now, what if the issue isn’t growth and health of your lawn or landscape but unwanted weeds and grass have begun to take over boundaries instead? Chemical services can help in the preservation of your hardscape, lawn and garden designs as well. While your lawn may have started as a plush area of grass, you may have noticed dandelions, crabgrass, and other unwanted weeds have begun to root in. With special chemicals, these weeds can be targeted while never harming those beautiful blades of grass. Rock wall or paver walkway beginning to get pushed around by weeds and grass? Stop the weeds in their tracks with a specialized chemical formula designed to kill and prevent weeds from growing in the future. With the use of these techniques and tools in landscape and lawn care, we can help the health of your commercial lawn and landscape take a stand against weeds and diseases! Contact us today to find out how our services can help you!